Thanks to International Association for Social Work with Groups (IASWG), the Group Work Camp became a tradition which happens in USA, Canada, and Europe. 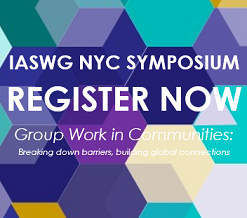 This unique event offers an opportunity for professional social workers, scientists and students to share their ideas, skills, and experience. And its remarkable atmosphere contributes to creating a space for multifaceted communication and different culture cognition. 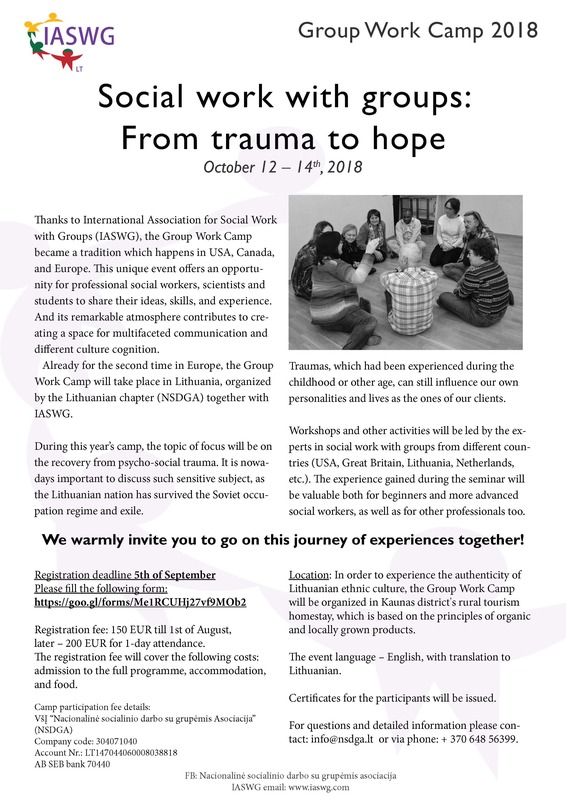 Already for the second time in Europe, the Group Work Camp will take place in Lithuania, organized by the Lithuanian chapter (NSDGA) together with IASWG. During this year’s camp, the topic of focus will be on the recovery from psycho-social trauma. It is nowadays important to discuss such sensitive subject, as the Lithuanian nation has survived the Soviet occupation regime and exile. Traumas, which had been experienced during the childhood or other age, can still influence our own personalities and lives as the ones of our clients. 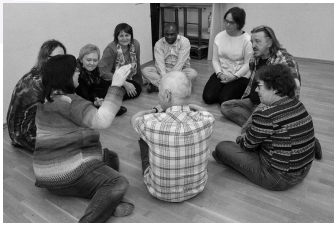 Workshops and other activities will be led by the experts in social work with groups from different countries (USA, Great Britain, Lithuania, Netherlands, etc.). The experience gained during the seminar will be valuable both for beginners and more advanced social workers, as well as for other professionals too. We warmly invite you to go on this journey of experiences together! Registration fee: 150 EUR till 1st of August, later – 200 EUR for 1-day attendance. The registration fee will cover the following costs: admission to the full programme, accommodation, and food. Location: In order to experience the authenticity of Lithuanian ethnic culture, the Group Work Camp will be organized in Kaunas district's rural tourism homestay, which is based on the principles of organic and locally grown products. The event language – English, with translation to Lithuanian. Certificates for the participants will be issued. For more information, contact: [email protected] or via phone: +370 648 56399.